It’s no secret I love to eat. Our grand adventure involves a lot of food. Travel is a conduit to cuisines of the world. And I couldn’t love that more. cuisine made with the freshest local produce. And I am also endlessly fascinated with the culture and history behind regional cuisine; pierogi of Poland; khao soi of northern Thailand; peka of Croatia, shopska salad of Bulgaria, tagine of Morocco. These foods are both storyteller and palate dancer. We’ve been in Spain now for more than a month. Last year we spent more than two months in Spain. I have learned to enjoy what is really a simple cuisine here in this country – locally sourced, simply prepared and not overly seasoned. Although the many regions of Spain have their individual specialties, the focus of the overall cuisine of Spain is fresh and seasonal. My only complaint about Spain is how late they eat their meals. Breakfast is barely a meal – just coffee and a croissant, maybe a tortilla (here in Spain ‘tortilla’ is an egg and potato dish, aka Spanish omelet) around 10am. Lunch isn’t until 2:00pm and dinner rarely gets started before 9pm. For this American, that is well past my bedtime. One of the reasons Spain eats so late is because they are in a crazy backwards timezone. Ever since Franco wanted Spain in the same timezone as Germany, Spaniards have lived with a VERY late sunrise and a VERY late sunset. So, they have adjusted their eating habits to accommodate. Unfortunately my internal clock is not so easily adjusted. little dishes served all day long. I have become a fan of tapas for breakfast, lunch and dinner. We have enjoyed my favorite tapas of Spain in Madrid, Santiago,Leon and Barcelona. But Sevilla loves its tapas bars (there are no tapas restaurants only bars – tapas are always served with alcohol) and the abundance of options is both fun and a bit overwhelming. In fact many will argue Sevilla is the birthplace of the tapa. We studied up a bit on where to go, what to eat and some history, then we set out on our own little “tapear”, the Spanish word for tapas hopping. Time to find my favorite tapas of Spain. popular is King Alfonso the 10th, The Wise King of Spain, had once been stricken with a serious illness which only allowed him to take in small portions of food with small amounts of wine. After recovering from his illness, the king issued a decree that no wine should be served at inns unless it was served with food. (credit A Brief History of Tapas, Pita Jungle). several throughout this blog); croqueta (very popular bite size fried cheesy nuggets often with jamon but we enjoyed it with duck as well as mint), montadito (tiny bite size jamon and pork sandwich), solomillo al whiskey (pork in whisky sauce), los pajaritos (tiny fried quail), patata (fresh potato chip), tortilla bites (egg and potato omelette), tortillita de camarones (fried shrimp pancake), espinacas con garbanzos (spinach and garbanzo beans), salmorejo (cold tomato soup), stuffed olives, thin sliced jamon iberico de bellota (acorn fed Iberian ham), pancetta frita (fried pork belly), grilled shrimp, boiled shrimp, sardinas ala parilla (grilled sardines), mussels, pulpo (octopus), razor clams, fried calamari, boquerones (anchovies) on toast, sausages and rabo de toros (bull’s tail). And those are just the ones I can remember. probably be a plate of olives, perhaps nuts or sometimes bread with ham and cheese or tortilla. It’s said that the original tapas were probably bread with jamon, which was used to cover your drink (the word tapa means ‘cover’). Despite the origin of the word, it now describes a cuisine unto its own. Though southern Spain and particularly Andalusia claim it, the popularity of tapas has spread, particularly to South and Central America, Mexico and the United States. a bounty of fresh goodness from the sea. Fabuloso and delicioso! Read my blog about food in Barcelona. I’m so glad we signed up for the four-hour port tasting tour with Porto Walkers in Porto Portugal. Our tour guide Alex was sensational. He really knew his stuff and I learned so very much. We visited three different Port houses. These houses are technically not in Porto, rather across the Douro river, in Gaia – they originally located there instead of in Porto because the taxes were lower!. It was fun walking with our group of about twenty from the Porto side, across the Luis the I bridge (built in 1881) to the popular port tasting riverfront boardwalk in Gaia. Our first stop on our tour was the amazing and historic Ramos Pinto House. Located in a stunning riverside big yellow building, it’s clear on arrival you are seeing something special. Founded by Adriano Ramos Pinto in 1880, Casa Ramos Pinto rapidly became noted, at the time, for its innovative and enterprising strategy, including the first to bottle wine and the first to really market and brand their wine using some risqué advertising for the era. At Ramos Pinto we enjoyed a full 50 minute tour of the original offices of Adriano Ramos Pinto, the cellar filled with hundreds of port-filled barrels, and a display that shows the incredibly unique shale wall system used to grow the grapes. After our tour we enjoyed a tasting of two of their Port Wines. We tasted a 7 year white which was very sweet (too sweet for me) and syrupy with notes of honey. We also tasted a 7 year Tawny that was deep, beautiful magenta, and also quite sweet. Our next stop was Quinta Santa Eufemia. Here we got a quick lesson on Portuguese cork as well as barrels used for the wine aging process before tasting a deep red Ruby Port which we accompanied with chocolate. It was a perfect pairing. I really enjoyed this port. Our final stop was Porto Cruz. By this time our group was getting to know each other and getting loud and friendly after three glasses of port. Pretty fun. We started with a Rose Port. This is fairly new on the market, conceived for a younger audience to help introduce them to Port. I liked this light, sweet wine. We took our Rose up to the roof top bar and enjoyed the music and the view while we waited as they prepared the tasting room for us. We headed to the tasting room where we tasted three more Ports. Our guide Alex did an awesome job helping us taste and consider the “notes” of each glass. The white was full of fruit flavors like apple, pear and pineapple while the Tawny and Ruby had notes of caramel, maple, chocolate and spice. We learned about terms like vintage and late harvest. We tasted a White, Tawny, and Ruby in addition to our Rose (strawberry notes). I enjoyed all four of the Ports from Porto Cruz. When we signed up for this tour I thought four hours seemed a really long time, but it went by so quickly because it was both interesting and fun. I highly recommend Porto Walkers and their Port Wine Tasting. Only 25 Euros and worth every penny. Ask for Alex – he was great. The Magical History Tour, what a ride it has been. I never thought of myself as having a bucket list. Mostly because I just want to see EVERYTHING and go EVERYWHERE. But I have realized over the past two months that I do have a bucket list, and I am slowly ticking things off that list, all while adding more to it. And for the past ten weeks the Magical History Tour has taken us away. We’ve been very lucky to see incredible things in our travels. Unimagineable things. Without even really realizing it we have seen five of the present day Seven Wonders of the World, included on that list was Petra in Jordan where we visited this week. I saw a television program about ten years ago about Jordan and they interviewed Queen Noor standing in front of the incredible Treasury building at Petra. I was smitten and knew I would visit there some day. It was easy to add Jordan to our Egypt itinerary. Now, having been in Jordan, I realize I could have added Egypt to my Jordan itinerary. Jordan is extroardinary. A cradle of ancient, biblical, Roman and natural history. We did not allow enough time to see it all. too many pockets are lined as a result of this music festival and the powers that be are not willing to give the festival up. Very sad as this site was truly impressive and needs UNESCO’s preservation assistance. The Dead Sea – my “no bucket list” bucket list has include floating in the Dead Sea for a long time and here in Jordan we had that opportunity. You can access the Dead Sea from Israel as well as Jordan, and in fact more of the Dead Sea is in Israel. But Jordan has a portion of it at the south end. It is truly amazing how salty it is and how buoyant you are when floating. In fact all you can do is float. You can barely walk or stand and swimming is out of the question because you just flip over and float. It tasted horrible and you certainly don’t want to get it in your eyes. But it was warm, clean, blue and a once in a lifetime event filled with lots of giggles. the Roman’s using it as such but originally it was a temple), is the most amazing of the antiquities in the site, the best preserved and most beautifully designed. There are several other amazing temples, tombs, palaces and more throughout the 60 square km site. We spent an hour and a half with a guide and then three hours wandering on our own including hiking up high above the Treasury for that iconic photo shot. We did not hike to the Monastery or the sacrificial site. We would have needed much more time than we had. I would love to come back here again some day – it is just so amazing, truly a wonder deserving its Seven Wonders status. So Jordan was a surprise, and worth the effort to get here. We felt incredibly safe at all times. The people are friendly and helpful and speak excellent English. I am so glad we came. Northern Denmark – where we learned captivating medieval and WWII history. Read about it here. Brugge – the beautiful historic town and now one of my favorite medieval villages. Read about it here. Berlin – the beguilling and resilient city of Berlin and the Cold War era history and Berlin Wall. Read about it here. All of Poland – incredible medieval and more importantly the World War Two history in this country made it one of my long time bucket list goals and experiencing Auschwitz (Read about it here) will remain with me all my life. Read about Poland here. Romania Castles – seeing the fortress cities and castles of Romania with their ancient history and stories (Dracula) was a long bucket list destination. Read about it here. Greece – although we had visited Greece before we had wanted to return for years. I suspect we will visit again too. The ancient Greek history in this country combined with the sheer beauty of the Mediterranean will keep it on our travel destination list for years to come. Read about it here. destination for me. And it did not disappoint. Seeing the Valley of the Kings, the Nile River, the Sphinx, the Pyramids and so much more was a bucket list triumph. I loved it all. And perhaps the friendliest people we have met. Read about Cairo here. And about the Nile Cruise here. The Magical History Tour covered about 10,400 miles including 11 flights, 5 train rides, 12 ferry crossings, 6 airbnb’s, 11 hotels, one river cruise ship, and 72 days. It was educational, insightful, fascinating, delicious and fun. But time to move on. Now we turn our attention to something new. We will spend the next four weeks and four days in Portugal and Spain. 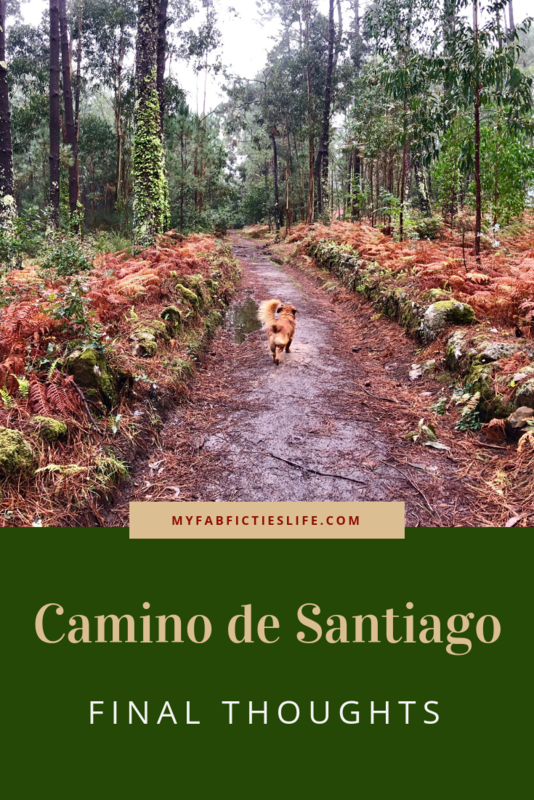 The first half of that time is focused on walking another Camino de Santiago. We start on Sunday to walk 250km to Muxia Spain. The Magical History Tour has kept us so occupied, we don’t really feel prepared either mentally or physically to tackle this next Camino. But nonetheless we will. I’m sure we will fall into the rhythm quickly. half months in the Americas (Florida, Panama, Columbia, Ecuador, Chile, Brazil, Costa Rica, El Salvador, Belize, Guatemala, Dominican Republic). I suspect there will be a great deal of magical history there as well. As always we thank you for your continued support and interest in our travels and My Fab Fifties Life. Watch for posts from Portugal and the Camino coming soon! Read about last year’s Camino adventures here.